“100-Day Art and Sea Adventure”. 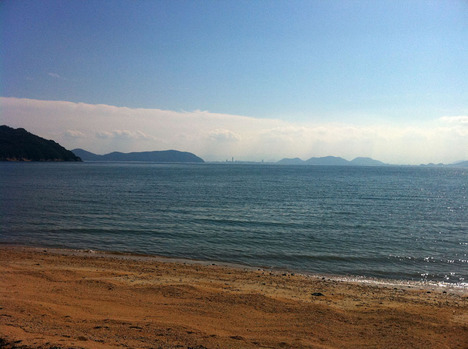 The Seto Inland Sea is surrounded by Chugoku and Shikoku districts in southern Japan. In this pleasant area with countless small islands, mainly islands located in Kagawa prefecture, a contemporary art eventSetouchi International Art Festival was held from this summer to autumn. The festival was directed by Furamu Kitagawa who has been successfully directed “The Echigo-Tsumari Art Triennale” in Nigata prefecture where is an area of heavy snowfall in Japan. 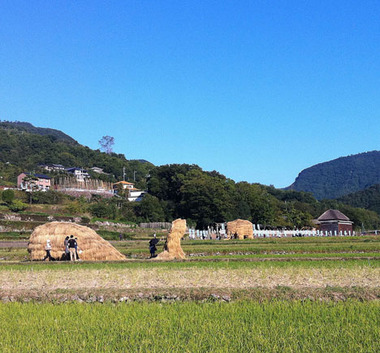 Same as the art festival in Tsumari, Setouchi International Art Festival was the landscape-scale art festival in a broad rural field. Visitors can experience local area by not only art works, but also local scenery and people’s daily life in the region. The art festival held in seven islands was served by ferry lines. 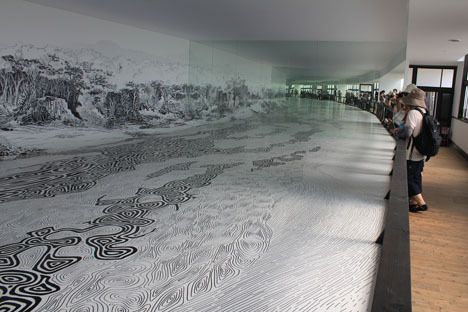 People talked about that it would take at least 3 days to look around most of the event, which took place in more than one town like Venice Viennale and Documenta. 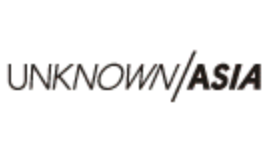 The main point of your travel to the festival was the capital city of Kagawa prefecture, Takamatsu. You could get a ferry via Takamatsu Port. I also started my travel from Takamatsu. I first headed to Teshima Island, where accepted tourists for the first time by exhibiting art works for this festival. There is another venue nearby island such as Naoshima, where is developed with a contemporary art museum and art fields which were built by an international educational company, Benesse Corporation and its founder. In Naoshima, actually there are no art works installed specially made for this festval. First, I visited the island where “was opened” for art. Many of the visitors from all over the world started their new experiences from there. The ferry line has been used daily as a connection between the island and the town. After an hour riding, I arrived at the port in Teshima via Naoshima. It was just a small port, but the local view of rural old private houses and the scenery of countless small islands during my travel from Takamatsu to Teshima were very beautiful. In the mountain on the island, a glass monument was installed in a pond. 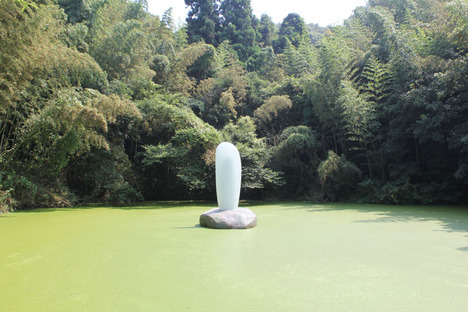 This is “Tom Na H-iu” by Mariko Mori and it was a mysterious piece like the meaning of the title “the place where souls waited to pass to their next life” in an ancient Celtic lore. This transparent work is networked to the observatory and it emits a light when a neutrino is detected. Ideally in the twilight or night was a good time to enjoy the light but there are no hotels in the island where has not accepted any tourists so far. So, in the daylight, the monument was standing well mannered in the pond which was covered with water plants in a dense forest. “Sea-Song of the Subconscious” is a sound installation by Cameron Robbins from Australia, consisting of a pipe organ on the seawall that produces sound by rhythm of waves and tides. The irregular sound made visitors smile. With this work, you could spend slow time with the island’s view, rhythm of waves and tides, and sound of the organ. I took a walk in a small village and could not ignore a stone-built warehouse. Olafur Eliasson‘s waterfalls made a small rainbow in the dark warehouse. The small pale rainbow in the chilly warehouse that may have been the same for a century provided us to feel the simple beauty of the light itself. 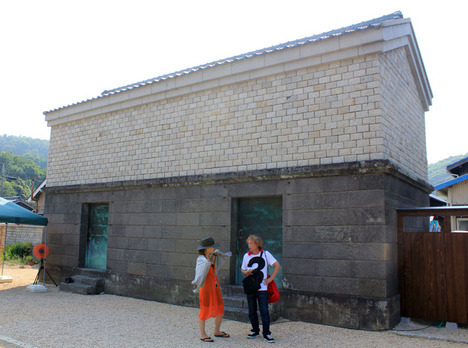 A new art museum was opened in Teshima at the end of the art festival. It started to prepare new permanent contemporary art projects such as “archive of heartbeat” by Christian Boltanski from France. The island, which used to have no art, is now getting to change into something new. The view of art works standing solitary in a rural scenery was a picture of “before development”. I headed to the next destination, two small islands, Ogijima and Megijima. 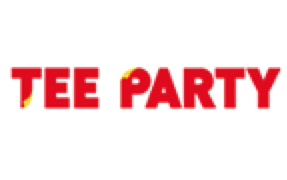 As they are literally read in the Kanji characters, each word means “man” and “woman”. Both island is located right next to each other. I was in a ferry from Takamatsu Port visiting to Megijima. On the way to the island, a massive “Ship of the Zipper” by Yasuhiro Suzuki could be found. The view of vessel glides through the water looked like a zipper opening up the sea. The humorous picture touched hearts of the visitor. 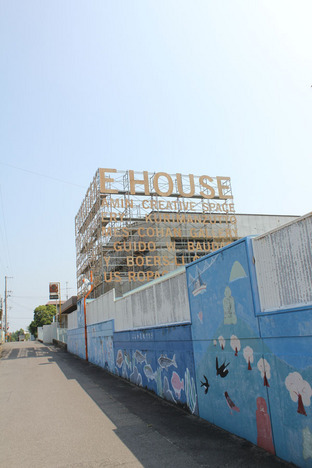 Organized by leading galleries, there opened a pop-up “Fukutake House” in the building of former Megijima Elementary School and Preschool, which were currently not being used. 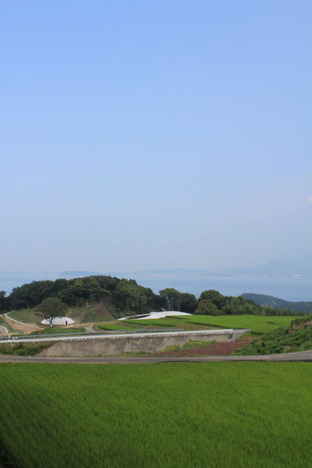 The name of the project came from the top director of the art festival, Soichiro Fukutake who transformed Naoshima into an art field and now trying to change Teshima as well. As it reflected Mr. Fukutake’s wide network of the contemporary art, art works selected carefully from leading galleries all over the world were featured in the space where visitors were deeply impressed by. A charcoal drawing animation in a classroom “Zephyr” by Naoyuki Tsuji from Tomio Koyama Gallery reminded me of my childhood memory in the elementary school. “Lost Paradise” by a photographer, Hiroshi Sugimoto from Gallery Koyanagi was a humorous piece that was comprised of “wit” using various items left in the elementary school. Although it was exhibited by the gallery and there were other his photograph works exhibited in Naoshima, his unique work could only be existed this place. 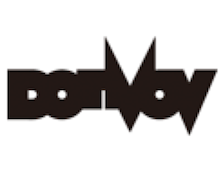 There was another film work which I just got interested. 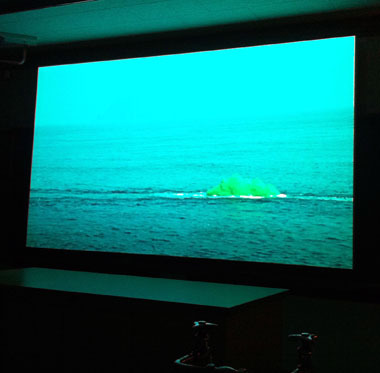 It is “Phantom Island” by Jun Yang from Vitamin Creative Space in China. 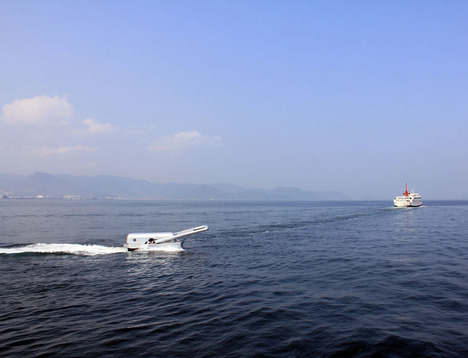 The Taiwanese artist created an imaginary island located on the border line on the sea between Taiwan, China, and Japan. Then suddenly the fabricated island made us rethink our identity. It also reminded us about Senkaku Island where it has been claimed by both China and Japan as their territory. During waiting for a ferry from Megijima to Ogijima, I swam in the sea. While Japanese summer is hot and humid, islands in Seto Inland Sea are in dry climate and my wet clothes dried very quickly after my swim. People could enjoy the blessings of nature between seeing exhibits in each island. I headed for Ogijima next. It is an island that just looks like a group of small hills. 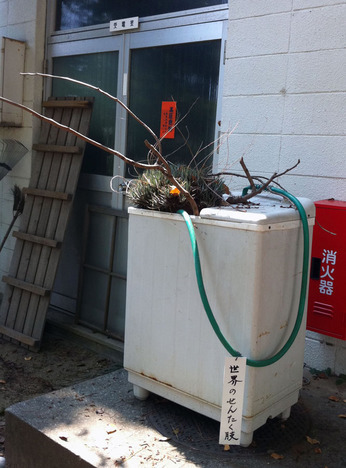 Art works and projects were randomly displayed along narrow paths which were not wide enough to drive through a car. After arrived at the island, we approached the terminal which welcomed me in many different languages . “Ogijima’s soul” by Jaume Plensa was made by the budget from the government. 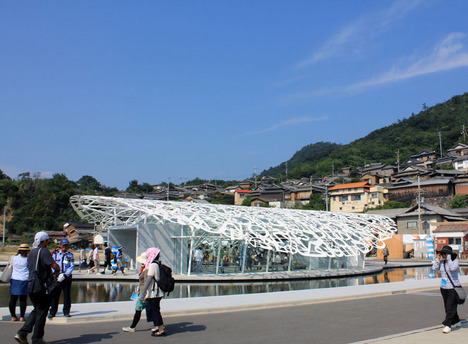 The common thing between two art festivals in Setouchi and Tsumari is that new remarkable architectures built every year to revitalize the local areas. The feature of the art festival directed by Furam Kitagawa is changing a rural area into a great attraction through the art. I walked along narrow path with hills in surrounding the island. Art works were displayed in many unexpected spaces on the paths and inside and ordinary houses. These interesting exhibits made our walking fun. Using a reception room in an empty house, there was an installation with the ceramic wave swells and a spray of ceramic flowers above “Sea Vine” by Haruki Takahashi. Beyond the delicate but dynamic ceramic wave swells across the room in a hill, Seto Inland Sea can be seen and it has been uniting the great view. 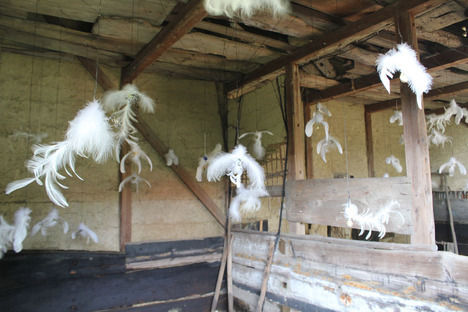 Unique creatures made from bamboo were able to find in a stable hen house. Various “sound objects” made from bamboo collected from the island were placed as if they were insects and small animals. Then I walked to the top of the hill. 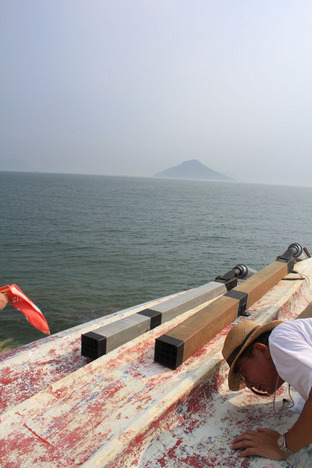 The great view of the island from the small shrine brought me a physical exhaustion with feeling of achievement and beautiful scenery away from daily life. Shikoku prefecture is the region where has quite small number of tourists from foreign countries. People, however, is deeply impressed by the “very Japanese” scenery, which consists of beautiful old houses and a traditional local culture. The last island I headed for was Shodoshima. As it was away from a lead of Takamatsu, Naoshima, and Okayama prefecture, it was kept away from a visiting route, but a group of exhibits was served in this second largest island among seven islands. People working to support the art festival on the island were very open-minded and friendly. It was a bit embarrassing to hang a name card from my neck, but “Make sure to write your name on your passport ticket. It is important in case you lose it.” The elderly men and women said to me everywhere. They had a illustrated map which was updating daily such as “A monkey appearance point” in a route. What a warm service. This area produces rice in terraced fields. Various straw-made figures were displayed in the harvested field. These straw figures were completed finally during the art festival period. Although these pieces were not famous designer’s work, these “art works” were made in collaboration with students of Musashino Art University and local people. You could come across a key to find the origin of friendly local people in the rural scenery. Back of the rice field there was a stage, which was built for a long time ago. People in the village have a culture to act and enjoy Japanese traditional play “Kabuki” and also have a spirit to welcome visitors from outside the village. 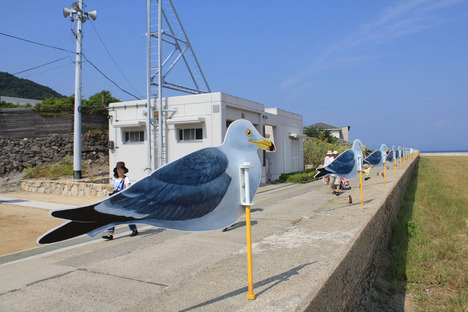 Setouchi International Art Festival became a new pleasant event for local people. “Giant in Our Minds” by Tatsuo Kawaguchi was located in an old rice granary. Installation pieces were displayed towards “something” which is meant to be a guardian spirit of the old building. As time has passed, “something” lives there. 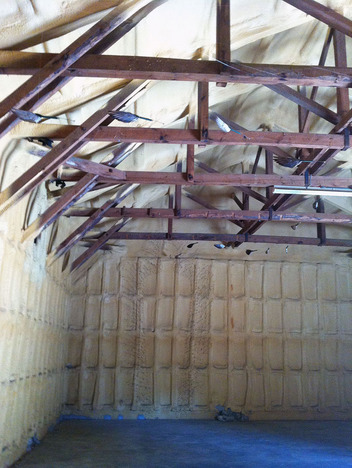 It is a space where I wanted to keep staying, as the installation represented artist’s respect for the local building and culture. 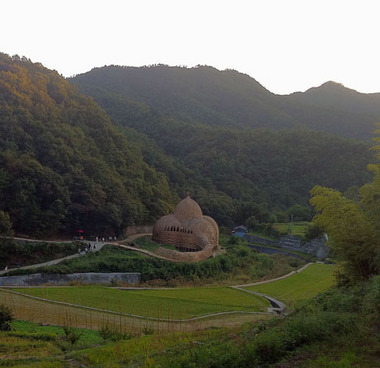 “House of Shodoshima” by Wen-Chih was a huge bamboo dome. People could feel comfortable wind and light in the bamboo-made dome. Most of visitors lay down and spent a relaxing time with their bare feet. This relax mood was one of main highlights of this festival where you can experience the locality. I would like to end this report by introducing “Soil Library Project” by Koichi Kurita at the library in an old elementary school. 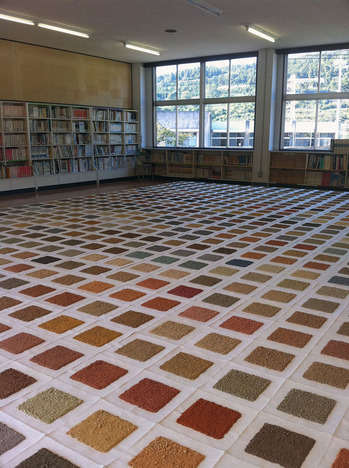 He took soil samples from every part of the Setouchi region and used them to create a geometric pattern on the floor. The work was a visual feast of the many-layered colours of soil itself. The festival exhibited various art works that reflect local features no matter whether the artist is famous or unknown. Art provides a new viewpoint of the local scenery and creates a new culture. The festival reminded us of what has been forgotten in our daily lives and this work had a key to this answer. A forgotten local scenery. An abolished library room has been kept in a good condition with many books donated from people in the village. An old good Japanese culture rests there. I took a history textbook for children, which ends with an episode of Japan’s postwar rehabilitation. 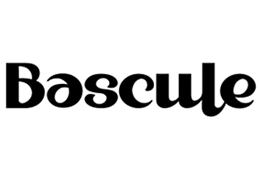 It was written by a hard working small family company to make products that could be imported to the world. This kind of small factories worked very hard on rehabilitation after the war, and it became a symbol of Japan at the time. This art festival was a project to connect people with not only art works but also a local culture in the Setouchi region. I did not report about other venues of the islands such as Naoshima and Inujima, because art projects in these two islands are available to see after the festival period ends. 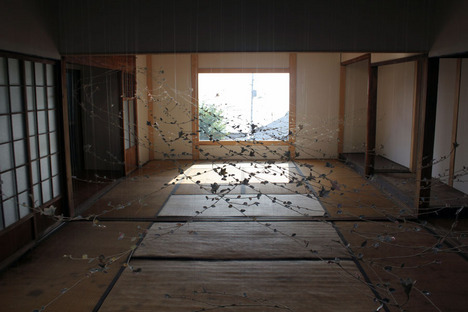 Many various art works will be keep exhibited in islands of Setouchi. 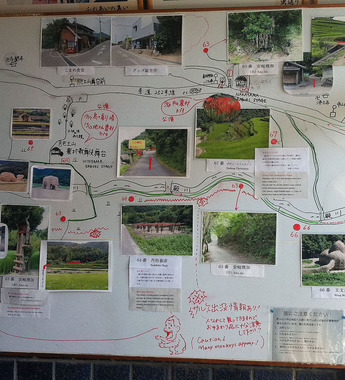 Would you like to travel to see art works in a great rural view of Japan?